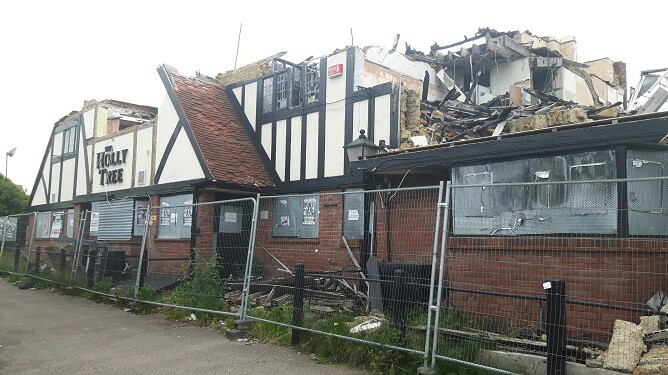 A Thanet council decision on plans to knock down the fire-damaged Holly Tree pub in Cliftonville and replace it with a development of 41 flats, three houses and a micro pub is still yet to be made. The fire damaged site remains untouched and fenced off following a blaze that ripped through the property last year. 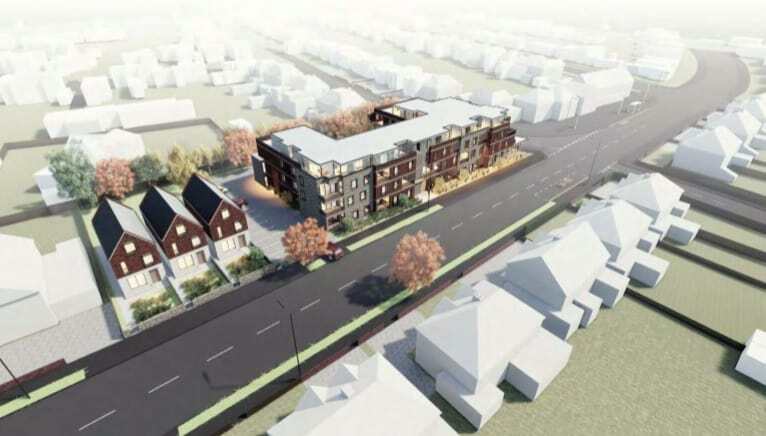 Sixty-five resident objections have been received in response to proposals to redevelop the site. 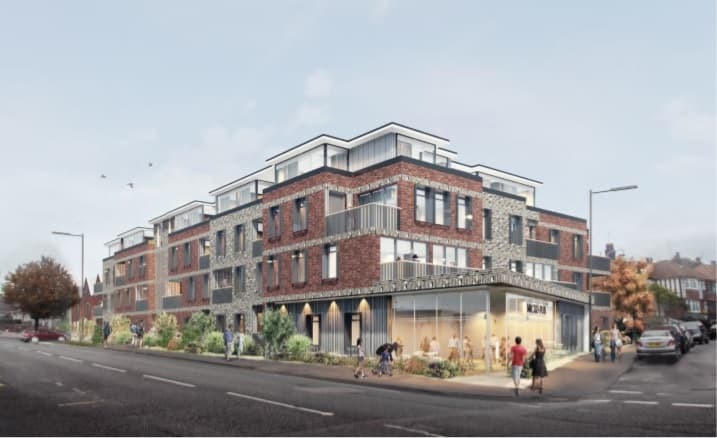 Kentish Projects has adapted original proposals from a 5 storey building to a three storey block with a recessed/cut back fourth storey to reduce density and height. Lower residential storeys would be fitted with recessed balconies to reduce the street impact. Detached properties would be in line with the existing dwellings on Northdown Road whilst proposed houses on Holly Lane have been removed to create a large buffer zone between the neighbouring buildings and proposal. The building would step down in scale towards neighbouring buildings, to the east and back of the site. A large communal garden is included and landscaping fronting Northdown Road has increased in size. The micro-pub would be on the Holly Lane/Northdown Road corner of the project. Four of the homes would be wheelchair-convertible. Eighteen parking spaces would be provided. Objections have been raised about lack of parking, over-development of the site and the building ‘not being in character’ for the area. The proposals, which have also been put forward as a Local Plan allocation, were submitted to Thanet council in January. A decision is yet to be made. 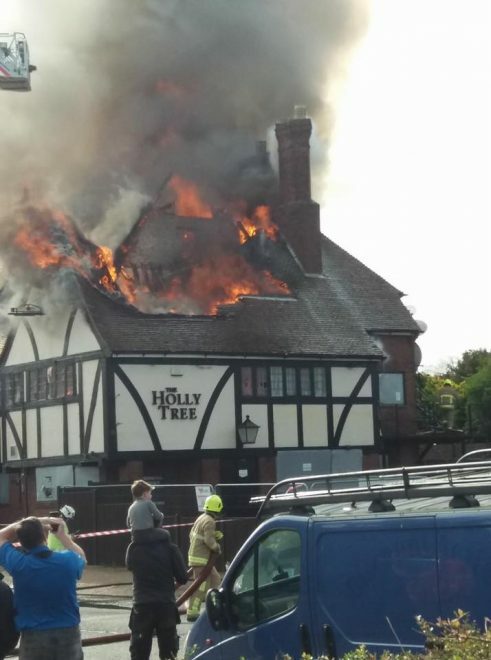 The Holly Tree shut its doors in 2016, never fully getting back up to strength after a blaze in 2014 started in the kitchen and ripped through the building. 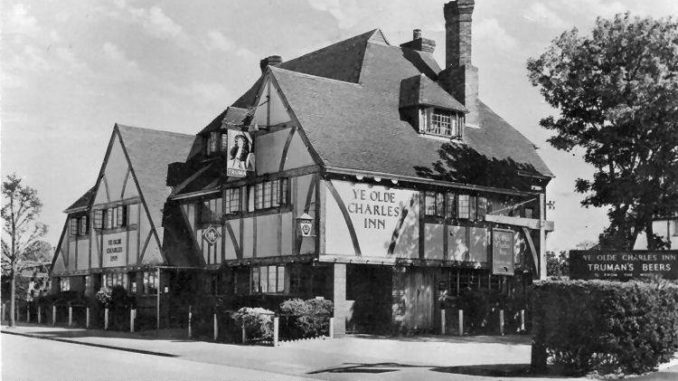 The pub, formerly Ye Olde Charles, was built in 1926 by Russell’s Brewery of Gravesend. A typical 1920s roadside inn, it was aimed at motorists visiting nearby Margate. It was named after local architect, Charles Reeve. During World War II Ye Old Charles was used by pilots and ground crew of RAF Manston. It is said that actor John LeMesurier used to drink in the pub when he was seeing Carry On actress Hatty Jacques, who used to live in Laleham Close. In 2013 Ye Olde Charles became The Holly Tree until it shut for good in 2016. In April 2017 a fire ripped through the building. Some 20 firefighters and six engines, including the specialist height vehicle, were used to tackle the blaze which was finally brought under control after some four hours. 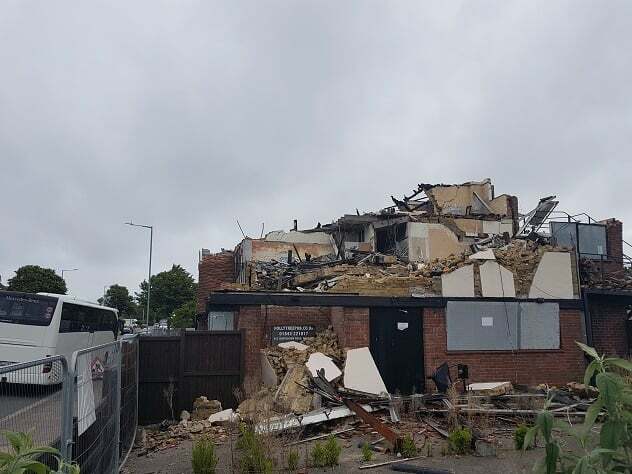 The property was so badly damaged that DDS Demolition were on site in the early evening to take down some of the parts of the structure which had become dangerous. 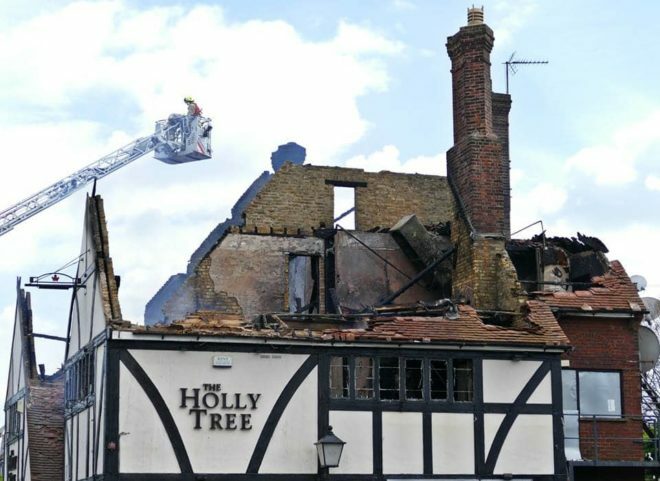 Kent Police said they were investigating the cause of the blaze, which started in the roof, as suspicious. As usual, to get their own way with a new over-development the old failing business mysteriously ignites and burns to destruction. This was the second fire, the first wasn’t damaging enough. Of course there is no proof of foul play. Then just leave the derelict site to decay, go up in value, and become an eyesore then everyone will be jumping to say yes to the first plans. Well it is an obvious overcrowded plan with too many flats and not enough parking spaces. It needs one less level in height and the 3 houses on Northdown road removed to give adequate parking off street for the rest of them, or remove the flats completely and just build houses with proper sized gardens suitable for families. The plans as they are are not suitable for that part of Cliftonville, but hey ho this council just passes anything so expect the worst. Why is it a site can be brought and the owner has no responsibility to keep tidy. Because Thanet District Council fails to use the powers granted to them by the Town and Country Planning Act Section 215 to force the owner to clear away this dangerous eyesore. I have written to them numerous times and they still fail to act. It is not surprising that the council is held in such poor regard by the citizens when they fail to protect the public and instead favour the greedy land-bankers.